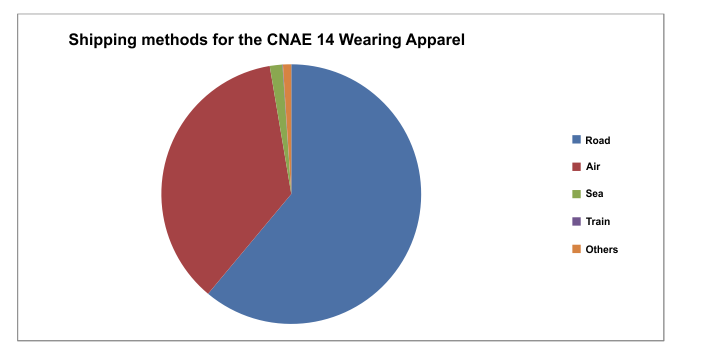 According to last 2012 stats data from AEAT/Customs Department of the Spanish Tax Administration Agency, Galician clothing exports (CNAE 14 Manufacture of wearing apparel) reached 3.177 million euros, representing a real increase of 15 % over last year's. As shown in the next table, it also represents the highest increase in the last years, when the average growth rate was around 8 %. Another relevant issue is the continuous increase in the current number of companies that have developed any export, that last year has reached the record figure of 288 companies. 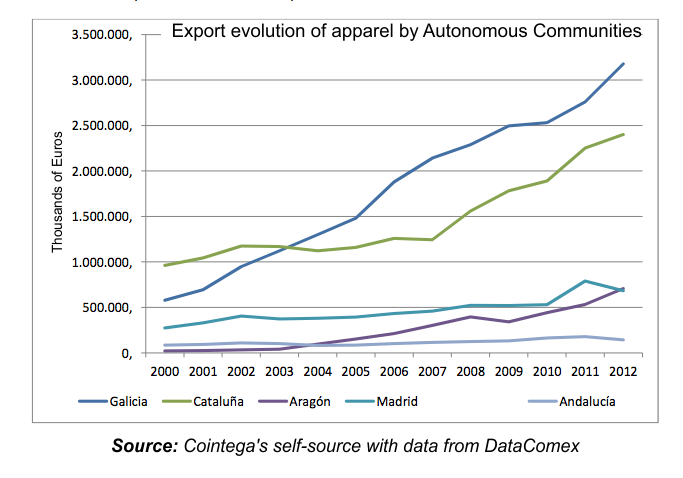 The next graph shows the number of companies that have developed any export operations from any of the Galician provinces, talking about stuff related to CNAE 14, Manufacture of wearing apparel. 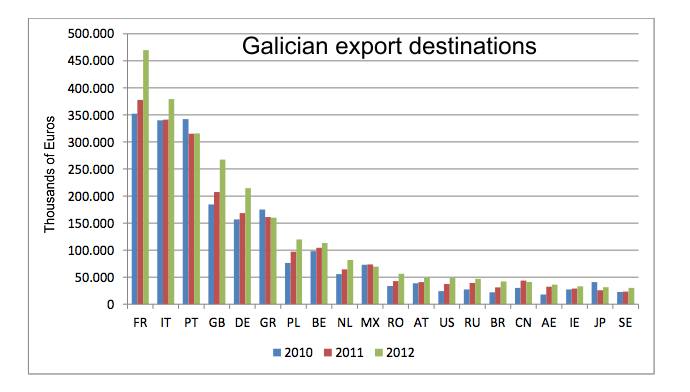 According to these latest data, Galicia continues to extend its lead in clothing exports, increasing the gap between Galicia and Cataluña, which has increased 7 %, so do the gaps with Madrid and Andalucía that decrease 14 % and 20 % respectively. 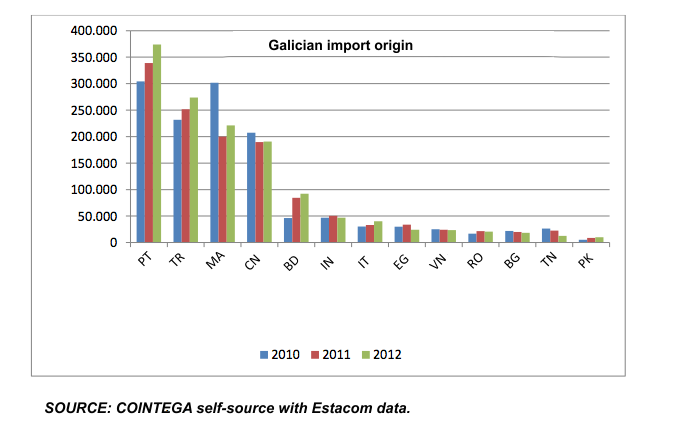 It's also remarkable the case of Aragón which has increased their exports 33 %, and this year has overtaken Madrid achieving a volume similar to Galicia in 2001. To properly judge the Inditex effect, that obviously plays in another division, we should separate the figures byprovince, and we'll be able to see that there are two provinces, where thisgroup of companies has its tax residences (Coruña y Barcelona) contribute with 73 % of the whole national exports, and that Zaragoza's raise to the third place corresponds to the opening of a new logistics hub of this companyin the city. 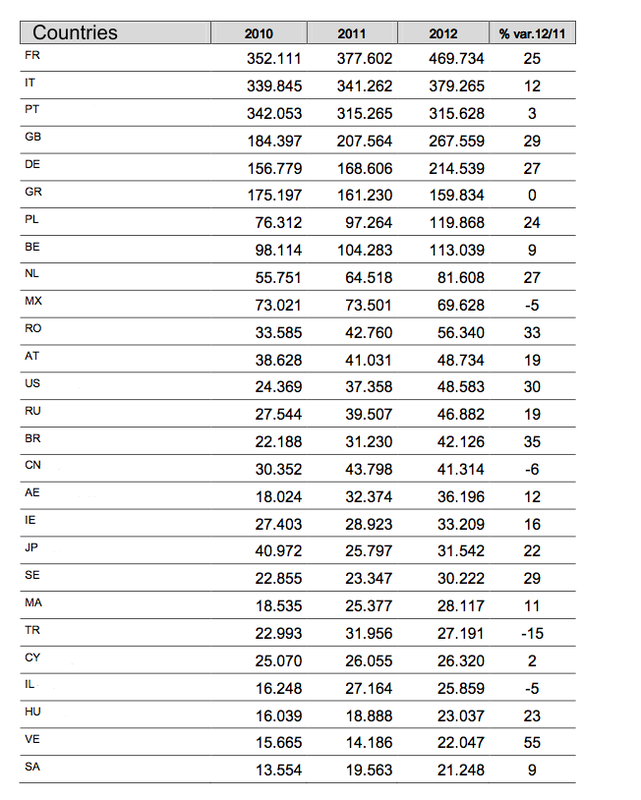 Having highlighted these points, it should be noted that Galicia has another 2 provinces, Orense and Pontevedra, where Inditex effect doesn't exist, in the national top ten, being the only region with more than one province in this classification. 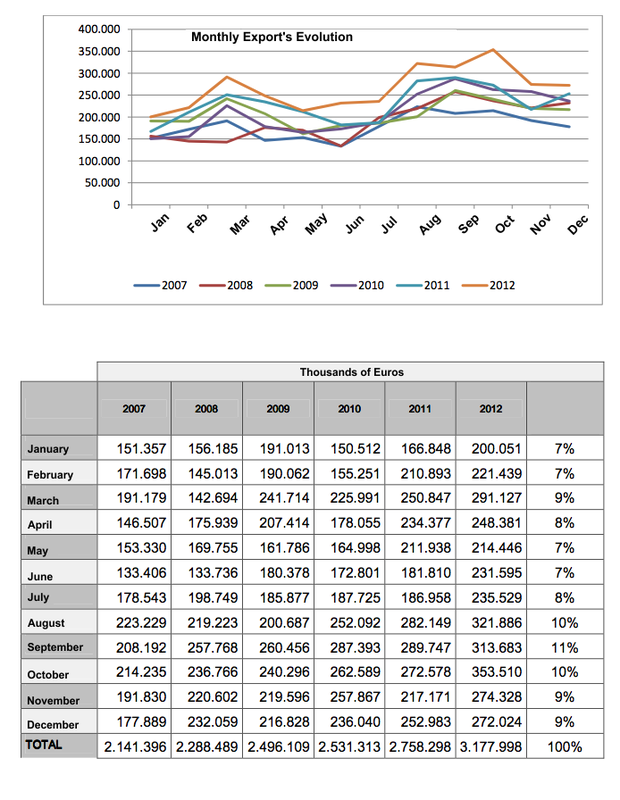 Through the monthly export evolution analysis, we can draw some conclusions, both as used channels and business models. In this respect, we should remember that companies usually delivered and checked their exports before the beginning of the new season, so there was a high seasonality, and most of the exports were concentrated in August and September for Autumm and Winter products, and in February and March to deliver Spring and Summer collections. However, as can be seen in the next graphic and table, the average export rate in August and September of the last six years, only represent 21% of years global, and February and March, another 16% (average prices of summer cloths are always cheaper than winter cloths prices). In other words, seasonality has dicreased,because the gap between worst months talking about exports, which represent 7% of global, and the best months, that represent 11% is only 4 points. These data show evidence of two realities, on the one hand, control over value change, and on the other hand, the existence of a high product turnover. Talking about distribution channels, the growth of one-brand stores or franchises, explain this regular behaviour. As regards of the product typology, female clothing overrides other issues, even though male clothing keeps shrinking the gap, growing 20% compared with 14% grewth of the female stuff last year. Next table shows which are the most used export means of transport, where road and air transports override the other means, becacuse of their flexibility and quickness. While there are some differences between provinces, these differences are explained because of limited access, infrastructures and company typologies. However, it's important to pay attention to the relationships between these rates and the absolute values, because 2% of sea trasport from Coruña represent a bigger amount of clothes than 19% of Pontevedra's export by sea transport. Textile and fashion Galician sector spreads throughout the region, with a bigger presence in three of the provinces, with singular features according to the most important company in everycase. So, in Coruña, statistics refered to Grupo Inditex, absolutly darkens the rest of stats of the other companies of the province. Something similar occurs in Orense, with the volumes offered by STL and AD. So, it seems that one of the keys for success in export, can be found in the size of the company and in the access to the different markets strategy based in the one-brand concept and not in the product,that has become a necessary, though not sufficient, condition. Anyway, also should be mentioned that there are some cases of small companies with a niche policy, accessing modern multi-brand stores, with a high quality and “nice” product are getting reasonable results. 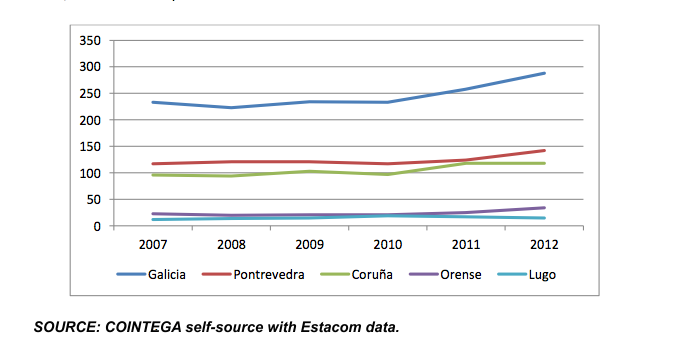 On the other hand, and on top of this, in previous paragraphs about the growing number of companies that have exported last year, which Pontevedra leads, it's also interesting to see the evolution of the average amount of every export operation. In a first sight, it seems that when we exportto our own one-brand store, the quantities are smaller than when we sell to a client. Anyway, it's an interesting data that everyone can check with the numbers of their own company. Even though our neighbouring countries continue to be the main export markets, the increasing importance of other markets is growing every day, exporting to 104 different countries last year 2012, though with large variations among the countries. In the lights of the figures in every one of this 104 markets, we can see two different action strategies, on the one hand, consolidation through a deeper bigger markets penetration, and, on the other hand, high growth rates, but still in low scale, in new emerging markets. In particular, the biggest average growthrates, have taken place in the exports to Perú, South Africa and Ecuador. This effect is causing a return of production to Galicia, specially to those factories which have been properly modernized and that have reached a critical size to become eficient. Anyway, we also should pay attention to some stuff produced far away, that is delivered directly to the markets where the clothes are going to be sold, this is the way companies with their own distribution system or franchises work, without taking their size into account. Iniciatives named “poalla” (fine rain), aimed to get to all the sector companies. Iniciatives focused in specific objectives. 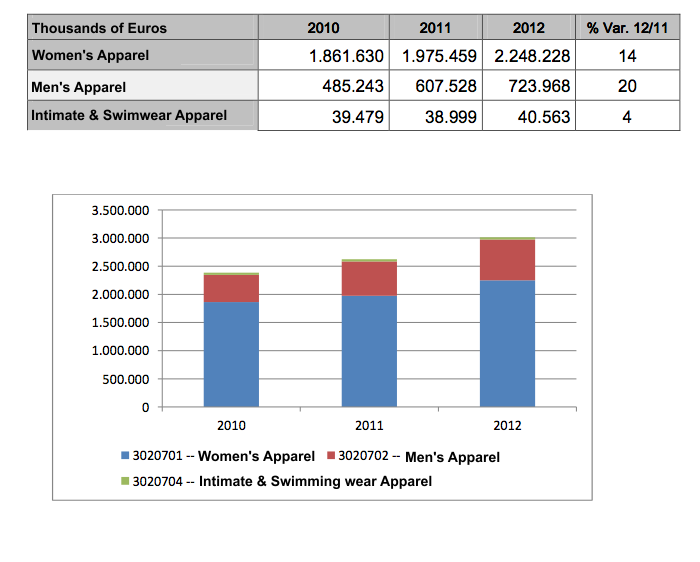 A clear example of the first ones is the internationalization aim and promotion order for textile, clothing and fashion companies, which with an average annual budget allocationof one million Euros, supported 36 different companies last year 2012, with an average grant of 25.000 Euros. Investments linked to their presence at international fairs, commercial research and diverse international marketing. Concerned to the focused iniciatives, this year 2013 we should highlight Plan America, that relies as main market objetives in Colombia and México, with a grant of 378.000 euros, financed 100 % by IGAPE, through a formal agreement with COINTEGA. Internationalization potential diagnostics of textil companies, also 100% financed by IGAPE is another interesting specific support line. Finally, as part of the shared with another sectors aids, we can mention Export Managers aid, which lets the companies to recruit directly from IGAPE's job boards, as well as take advantage of consulting COINTEGA's professionals, focused on smaller and less experienced companies.